The County of Hainaut (French: Comté de Hainaut, Dutch: Graafschap Henegouwen; German: Grafschaft Hennegau; Latin: comitatus hanoniensis), sometimes given the spelling Hainault, was a historical lordship within the medieval Holy Roman Empire with its capital eventually established at Mons (Dutch: Bergen), and named after the river Haine, both now in Belgium. Besides Mons, it included the city of Valenciennes, now in France. It consisted of what is now the Belgian province of Hainaut and the eastern part of the French département of Nord. Originally a gau of Lotharingia, Hainaut was briefly a part of West Francia (911–25) before becoming definitively attached to Germany. The county was divided in 958 and emerged in its more or less final form in 1071. Hainaut was culturally and linguistically French. In 1432, Hainaut was acquired by the House of Valois-Burgundy and in 1477 passed to the Habsburgs with the rest of the Burgundian Netherlands and became part of the Burgundian Circle in 1512. It was ruled by the Spanish branch of the Habsburgs from 1555 to 1714. In 1659 and 1678 southern Hainaut was acquired by France. In 1797 the rest of the county was ceded to France by the Emperor Francis II, who was also count of Hainaut. In Roman imperial times, Hainaut was, at least for the most part, situated in the civitas of the Belgic Nervii. As the empire lost control, this entire region came under the lordship of the Salian Franks, within their Neustrian territory. By the time of Charlemagne, the Frankish empire had been declared a new "Holy" Roman Empire. 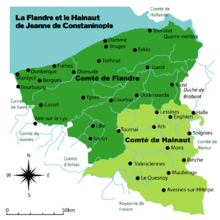 The County of Hainaut was established about 900 in the Lotharingian part of the Frankish ruled lands, when Duke Reginar I of Lorraine, a grandson of Frankish Emperor Lothair I, took the title "Count of Hainaut". After the death of the last Carolingian king in East Francia, Louis the Child in 911, Duke Reginar joined the West Frankish realm under King Charles the Simple. His son and successor, Duke Gilbert, in turn submitted himself to the German king Henry the Fowler in 925, whereafter the Duchy of Lotharingia remained a part of the eastern Frankish kingdom which would become Germany, but on the border with the western kingdom which would become France. The unification of the County of Hainaut as an Imperial fief was accomplished after Arnulf's defeat in 1071, when Richilde and her son Baldwin II tried to sell their fiefs to Emperor Henry IV. Henry IV ordered the Prince-Bishop of Liège to purchase the fiefs and then return them as a unified county to the countess Richilde and under feudal intermediance to the Dukes of Lower Lorraine. After the death of Duke William II of Bavaria-Straubing in 1417, Hainaut was inherited by his daughter Jacqueline (Jacoba), who in 1432 had to cede the county together with Holland to Duke Philip the Good from the House of Valois-Burgundy. The last independent countess died early on 8 October 1436 (presumably of tuberculosis) in Teylingen Castle, near The Hague (where she is buried), her estates were incorporated into the Burgundian Netherlands. When Charles the Bold of Burgundy was killed at the Battle of Nancy in 1477, the male line of the Burgundian dukes became extinct. In the same year, Charles' daughter Mary of Burgundy married Archduke Maximilian I of Habsburg, the son of Emperor Frederick III. King Louis XI of France hoped to take advantage of the death of his cousin, Charles, and sent an army to invade the Netherlands. However, the French were defeated at the Battle of Guinegate and Hainaut became a part of the Habsburg Netherlands by the Treaty of Arras in 1482. In 1556 it became part of the Spanish Netherlands. In 1579 Hainaut was a member of the Union of Arras which submitted to the rule of Habsburg Spain, while the northern Union of Utrecht rebelled and formed the Dutch Republic in 1581. The 1659 Treaty of the Pyrenees and the 1679 Treaties of Nijmegen cut the County in two. The southern area, around the towns of Valenciennes, Le Quesnoy and Avesnes, was ceded to France under King Louis XIV (see French Hainaut). The northern area, around Mons, remained under the Spanish Habsburgs, and was then part of the Austrian Netherlands after the 1713 Treaty of Utrecht. The Habsburg Emperors ruled it until 1794, when it was absorbed into the French First Republic. This page was last edited on 21 February 2019, at 00:30 (UTC).